If you have more than one user on your Mailchimp account, you can edit collaboratively in the Campaign Builder. You'll be able to see which account users are working on the campaign, send tests to request feedback, and leave or receive comments. In this article, you'll learn how to use our collaboration features to create a fantastic campaign. 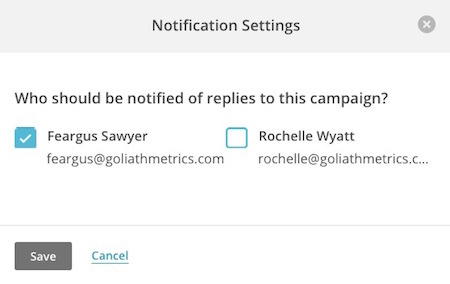 We'll display a notification at the top of the Email Designer if more than one account user is in the campaign. Click the notification to display a drop-down list of the active users in the campaign. When an active user manually saves the content block they are working in or an auto-save occurs, your screen will refresh automatically to display the new content. The system auto-saves every twenty seconds when working in a content block. 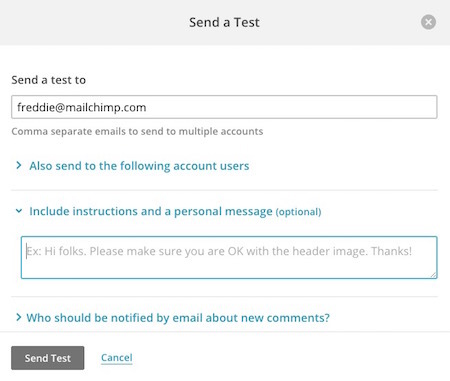 When you send a test email, you can include optional instructions and a personal message. Recipients can reply to the test email with their feedback. We use an inbound email address to send their feedback directly to your Mailchimp account. Any feedback for this campaign will appear on the Comments tab in the Campaign Builder. 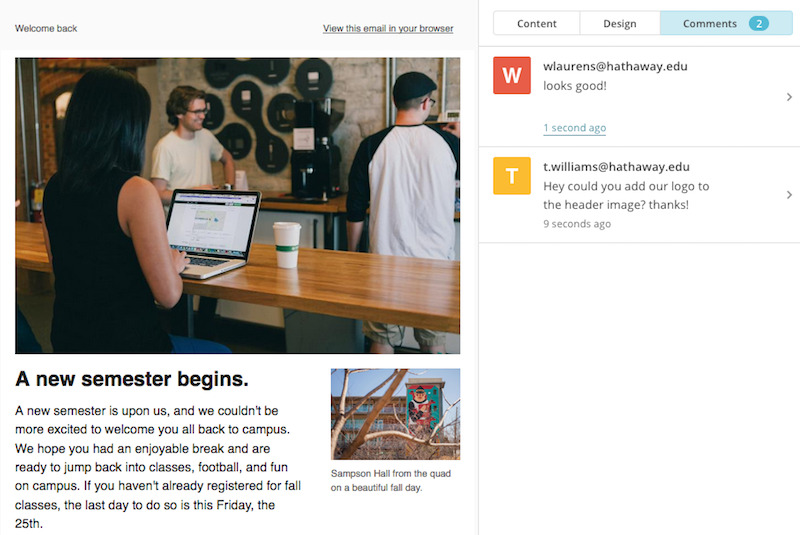 In the Email Designer, use the Comments tab to share notes and feedback about the campaign. If there are new comments on the campaign, we'll display a badge on the tab that shows the number of new comments. Account users can reply to existing comments from the Comments tab. Click the Notifications link in the Comments pane to send an email notification to account users when a new comment is added to the thread. Once you've read or responded to the comment, select Mark Completed to close the thread. All closed comments are visible on the Comments tab and are marked with a check. Closed comments can be re-opened if there is additional information or work needed. New comments on draft campaigns are also noted on the Campaigns page, next to the Edit button. Click the drop-down menu to view them in the Campaign Builder. You can view comments for draft campaigns only. Comments are not available for sent campaigns. Collaboration features are not currently available for Plain-Text Campaigns. 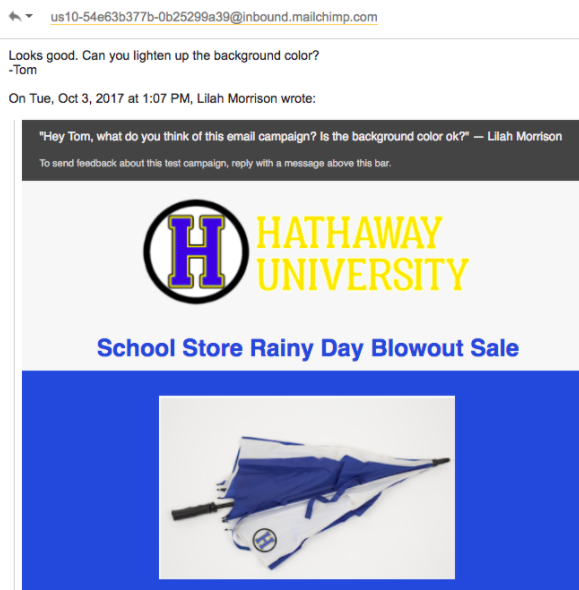 Replies to test emails for Plain-Text Campaigns are sent to the From email address for the campaign, but those replies cannot be viewed in your Mailchimp account. Many Gmail users set up aliases for their email addresses. An email alias is essentially an alternative email address that points to one or multiple other existing user email accounts. Due to the way Gmail handles those type of addresses, it's best not use an email alias as the reply-to email for a campaign. Replies to a test email for a campaign with an alias reply-to email address may not be logged as expected in the Comments tab for a campaign.